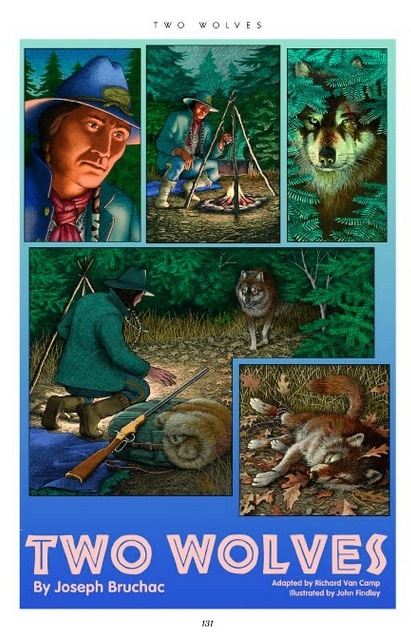 Beverly Slapin's Review of Pomplun, Smelcer, and Bruchac's NATIVE AMERICAN CLASSICS “Telling readers what to think” is the main problem with some of the pieces in this collection, problems inherent in transmogrifying stories by the earlier Indian writers into a genre in which graphics foreground the story—and the graphic artists don’t always understand it or their work is mismatched. Another problem is that often, details are belabored in “dialogue bubbles,” at the cost of the integrity of the story. Yet another is that stories are sometimes “edited down” to what is seen to be the reading level for this kind of anthology. And finally, the stories would have benefited greatly with prefatory material that clearly set each in a historical, geographical, political and biographical context. This last problem, again, although inherent in this genre, stands out most glaringly in what is purported to be a “multicultural” anthology.And:Some of the stories and poems in Native American Classics are incomparably beautiful—some whose texts have been left whole and some that have been adapted. Some of the art in Native American Classics is—to use a descriptor I’ve recently been known to use too often—awesome. Others, not so much. Teachers who would want to use Native American Classics to introduce “reluctant readers” to Native literatures should do so with caution.Slapin goes through the 18 stories one by one. By my count, she gives nine stories a "recommended," seven a "not recommended," and two a mixed recommendation. So her review is more positive than not by a slight margin. While Beverly Slapin is a reviewer I respect (and who has been kind to my own work in the past), I think that her main criticism of this book has as much to do with her dislike of the whole idea of turning already published works into graphic texts as anything. When I spoke to Beverly before she wrote this review she voiced her opinion that if these stories already were in print, then why would we want to have them rewritten in this fashion? My own feeling, which I expressed then and still have now, is that we are introducing a whole new generation of readers not just to a generation of largely forgotten Native writers, but also to some of the best Native American illustrators now at work. I also remain committed to the idea that comics are not just for people "who like that sort of thing" but are a legitimate art form and a form that has been proven not to be a substitute, but simply another genre as worthy of respect as non-illustrated works. Further, comics encourage reading and require a serious intellectual commitment on the part of the reader. In any event, I think Beverly's review--while I find myself in disagreement with parts of it--was a serious attempt on her part to voice an intelligent critical opinion. And while, as I've said, I can't agree with all her conclusions, it's good to have more than one side expressed about any work of art. Quite frankly, no matter what any critic says, the work always has to speak for itself. And it is my belief that anyone with any familiarity with the graphic form will find this anthology immensely rewarding and, quite likely, a meaningful introduction to significant writers and artists they may never have encountered before. And anyone interested in Native American writing and art will find this collection well worth reading.True, several of her criticisms were along the lines of she didn't like the art, or the art didn't match the text. These may be valid criticisms, but they're artistic issues, not cultural issues. I'm not sure she should be mixing the two, especially since her forte is the cultural area. Also, she didn't like any story with a Christian underpinning. These stories may not be traditional, if "traditional" means pre-Christian. But they may be authentic for the time and place in which they were written. It's a fact that many Indians were Christianized during the 19th and 20th centuries, and that's part of their experiences. It doesn't necessarily make them less authentic. For more on Native comic books, see A Pilgrimage of Love & Forgiveness and INC's Universe #0. Native American Classics is a very rewarding book that features too many fine Native writers and artists to name here. Suffice to say it is an excellent anthology that shows the state of the art in Native American art and narrative.